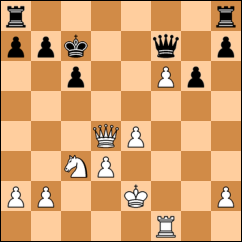 The worst possible blunder you can make in chess is to resign in a winning position. Accepting a draw in a winning position is only half as bad, but it is still pretty disappointing, especially after working hard for hours. In the Boylston Chess Club‘s ongoing Paramount tournament, I’ve already managed to accomplish that dubious feat twice — and against the same player each time! Against Ken Ho in the first round, I misplayed a tricky opening and he took advantage of it to win the exchange. As often happens at these levels, losing material freed me to just try to deploy my pieces actively while he hunkered down and tried to simplify at the expense of the initiative. After a little combination (which had a fatal flaw, but neither of us noticed it — welcome to chess at the 1700s level! ), I had gained a pawn, put his king on the run, and had a couple of nasty passed pawns. A few checks back and forth to gain time on the clock and it was time decide whether to go for the win or accede to the perpetual. All my attention was focused on pushing my passed pawns, but after moves like 27.e5 I just didn’t see a way past Black’s blockade, especially since his a8 rook was going to finally be able to enter the action. After using 8 of my 32 remaining minutes before move 40 to think about it, I played 27.Qe5+?? and Ken played 27…Kd7, repeating the position for the third time and claiming the draw. But as club champion Chris Chase always says, “Check the checks!” 27.Nb5+! wins trivially. If 27…cxb5 28.Rc1+ Kb8 29.Qd6+ and mates; if 27…Kc8 28.Nd6+ picks up the queen; and if 27…Kb8 28.Qe5 Kc8 29.Nd6+ gets the queen again. Why didn’t I see it? 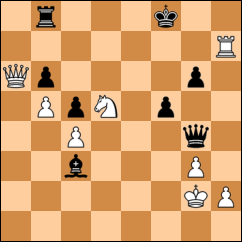 I was tired; I was focused too much on the passed pawns; and the c-file had just been opened so the idea that Rc1+ could happen didn’t register. But with all of those things working against me, I still would have found it if I had just checked the checks. Our rematch occurred a few weeks later (the Paramount is a double round robin). I acquired what I thought a nice positional advantage, and when Ken sacked a pawn that was ultimately doomed anyway, I thought I would cruise to victory. But I exchanged the wrong set of minor pieces, and he ended up with a nasty outposted knight and open lines into my position. Seeing the chance for a perpetual check, I flung a few pieces forward, and it worked, as Ken saw through one perpetual check idea but not the other. Clearing the move-40 time control with minutes to spare, I accepted White’s draw offer. But Black is winning! After 41…Qe2+ 42.Kh3, 42…g5! threatens Qf1 mate, and White has no way out. It’s a little tricky, especially since my own king is in some danger, and I think I didn’t even really think about Qe2+ since my queen had come from e4 and it was natural to move it back there. It’s also unintuitive to be able to mate with basically one piece. But I had tons of time, and worst, we were 10 minutes away from the game being adjourned, at which point I could have gone home and analyzed it at my leisure (and offered a draw over email if that didn’t turn up anything). There was nothing to lose from letting my clock run down 10 minutes, since I had the draw in hand. What is painful about both of these situations is that it was simply a process failure, not a failure of imagination or calculation. In the first game, I had 30 minutes left and a draw in hand, and just had to check the checks, as I should be doing every move of every game. In the second, I had nothing to lose from checking out the position at home instead of immediately accepting the draw. This was high up on the list of Books I Really Should Have Gotten Around To Reading By Now. (The next highest book on the list is probably Jonathan Franzen’s The Corrections.) All I really knew was that it was about a hermaphrodite, which indeed it is, but there’s actually a bit less of that than I expected. First of all, the novel starts out with the narrator’s grandparents, and doesn’t even get to the narrator’s own life until maybe 40% of the way through the book – and then only really follows that life until the age of 15 or so. So we get a lot of entertaining background (though the background is interesting and continues to shed light on the narrator’s own experiences throughout the book), and then we get the narrator’s life up until the point that she 1) discovers that she’s not totally a she and 2) decides he’s a he, but there’s disappointingly little about his life after he decided how he was going to live it. I still enjoyed it; I like these multi-generational family epics, and the science and sociology of Calliope’s condition was interesting and well written. The artistry that is put into every sentence was especially obvious since I came to this book straight from Brandon Sanderson’s Mistborn books, which were written extremely straightforwardly (not that I had a problem with that). One thing that I particularly appreciated although I bet many other readers found it a little annoying was Eugenides’ willingness to make explicit the themes that kept cropping up. Oh hey, yeah, I guess the burning of Detroit does recall the burning of Smyrna 300 pages ago, now that you mention it, thanks for reminding me. I’m sure the actual literature readers roll their eyes at the author’s assumption that the reader needs these correspondences spelled out, but it worked well for me. Middlesex won the Pulitzer Prize, and I must admit that having picked it up with Pulitzer-size expectations I felt that it didn’t totally live up to them. But it was still an excellent book, and I’m happy to have read it for reasons other than just being able to cross it off the list.